This is an article with some scientific evidence that carrying guns doesn't make people safer. It's moderate length. Read at least the first third. "For years, the question has been, is there any public safety benefit to right to carry laws? That is now settled," said paper's lead author, John Donohue. "The answer is no." Watch the Motherboard documentary about the strange history of smart gun technology in America. Donohue and his co-authors looked at crime data from 1977 to 2014, both nationally and in 33 states that implemented "Shall Issue" concealed-carry laws during that period. The statutes are the handiwork of the NRA, which has by now successfully lobbied politicians in all but a sliver of state capitols to relax their standards for issuing permits to carry concealed guns. "Shall Issue" states, which Donohue refers to as right to carry (RTC), require that concealed-carry licenses be granted to anyone who meets basic criteria. Unsurprisingly, they accept permit applications at a higher rate than "May Issue" states, where authorities have greater discretion to decide who is fit to go about the world armed. Since lowering the bar for concealed-carry licenses gradually leads more people to get those licenses (Florida alone has nearly 1.8 million people permitted to carry concealed guns, and Pennsylvania and Texas each have around one million), and because more guns in public is supposed to reduce crimes, then we should expect states to see less crime as "Shall Issue" laws kick in. The Stanford team found precisely the opposite: "Ten years after the adoption of RTC laws," they write, "violent crime is estimated to be 13-15 percent higher than it would have been without the RTC law." Prior assessments of right-to-carry statutes came earlier in the waves of "Shall Issue" laws that first swept states in the 1980s and mid-1990s. One of those was a well-known 2004 report from the National Research Council that also poked holes in Lott's conclusion—but could not say definitively which way right to carry tilted crime rates, because there weren't yet enough years of data to sift. Because the Stanford team was able to look at what was happening in states where expanded carry had been in place for a decade or more, it reached much stronger estimates of the effect of "Shall Issue" laws on crime. The Stanford team suggested that the increased carrying of guns could have contributed to rising crime through several means. As more law-abiding residents arm themselves, so might the criminals in the same communities—rather than the other way around. Lawful gun-permit holders, the researchers theorize, could contribute to a street-level arms race by bringing more weapons into public, where they are more likely to be lost or stolen, making their way to the black market. The more that people become aware that their environs are filling with guns, their perceptions of society could become colored by fear and anger, thus leading them to more readily become violent. "I wasn't surprised to find violent crime went up," Donohue said. "You'd expect guns to contribute to violent crime." The Stanford findings fly in the face of not just the NRA's message, but common understandings of crime trends over the last two decades. By national measures, violent crime has fallen dramatically after peaking in the early 1990s, and that drop has largely coincided with the expansion of the freedom to carry concealed guns. Lott and others are eager to point to declining national crime numbers as evidence for their theory, or at least to blunt concerns that more guns in public would lead to widespread bloodshed. Examining statistics from the US Census Bureau and the FBI's Uniform Crime Reporting data, the authors estimate that states with stricter concealed-carry laws saw crime fall by 42 percent from 1977 to 2014. That drop is more than four times greater than the 9 percent decrease seen in right-to-carry states. In conducting their analysis, the Stanford researchers wanted to make sure that it was differences in concealed-gun laws, and not some other factor—diverging economic fortunes or police staffing, for example—that sent crime plunging in some places but not others. To find out, the team projected what would have happened in right-to-carry states had they not relaxed concealed-carry standards, accounting for differences in demographics, policing, and economic growth. Here, too, the team was able to run calculations that were not possible in the 90s and mid-2000s, when the academics who first subjected Lott's theory to scrutiny had significantly fewer years' worth of data to crunch. The Stanford findings rest on two statistical methods with obscure-sounding technical names: panel data analysis and synthetic controls analysis. Panel data essentially tries to break down complex social phenomena—crime being very much one of those—by studying their smaller, more easily measurable components, like incarceration rates, police staffing levels, poverty, income, and population density. Synthetic control analysis allows researchers to compare data recorded after the introduction of a change—like a right-to-carry law—with projections based on what might have happened had the change never occurred. The synthetic controls projection is based on demographic data and outcomes in demographically similar places. Different researchers make different judgments about which factors have the most power to drive crime up or down. Rather than rest their analysis on a single set of variables, the Stanford team ran their 37 years of crime data through four different panels: their favorite, called DAW; one developed by the nonpartisan Brennan Center; the panel John Lott used in More Guns, Less Crime, and a fourth favored by a pair of pro-gun researchers named Carlisle Moody and Thomas Marvell. Projections made with all four panels showed that states with right-to-carry laws would have had even greater decreases in violent crime had those places not loosened their gun laws. "The panel data gave no hint that anything good was coming from the right to carry," Donohue said. Take Texas, for example. Donohue's projections found that ten years after the Lone Star State put right to carry into effect, violent crime was more than 16 percent higher than it would have been without that law, as laid out in the graph below. 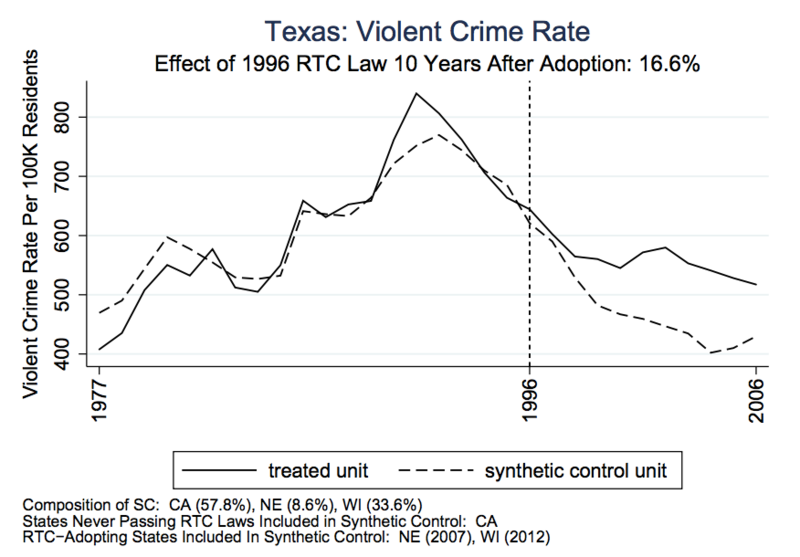 The dotted line, labeled "synthetic control unit," is a projection of what might have happened to Texas' violent crime rate had it not loosened its concealed-carry statute, based on a composite of demographically similar states. The only difference between projections using the pro-gun scholars' preferred variables and the other two panels came when singling out murder. The highest purpose of the armed citizen, in the rationale of the NRA and gun sellers, is to subdue or incapacitate marauding psychopaths before the killers can take innocent lives. But when the Stanford team ran the pro-gun researchers' formulas, the graphs showed that right-to-carry laws actually propped uphomicide rates. The DAW and Brennan Center panels, on the other hand, showed only that non-fatal violent crime would be lower if states had never opted for the "Shall Issue" route. And they showed that in all 33 states where they ran the simulation, with no exceptions. But does better research actually mean better real-world outcomes? For that question, Donohue relies not on sophisticated math, but his years of experience studying the gun issue. "Many people have such strongly fixed ideas about guns," he conceded. "It's hard to influence their thinking." Donohue may be understating the challenge that he and other scholars confront. Sociological and anthropological research suggests that Americans' feelings about firearms and whether to carry them for self defense are driven by elemental notions like identity and masculinity, rather than empirical measures of safety gained or lost. The NRA has gone to great lengths to foment the idea that the right to carry guns is the bedrock of American citizenship, and the option of lethal self defense is "the first freedom." Gun companies market firearms to appeal to consumers' need to see themselves as powerful and, often, hyper-masculine protectors. It's hard for an academic paper to break through those kinds of beliefs. But policymakers and judges are a different kind of audience than gun buyers or voters. Donohue hopes his findings make it in front of those influential eyes. "The Supreme Court is eventually going to have to decide if there's a right to carry," he said, speaking the day after the justices declined to hear a challenge to California's restrictive right-to-carry law. "What will they make of this evidence?"